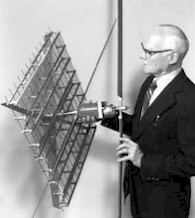 William C. Brown is considered by many to be the father of microwave power transmission. He went to Iowa State University and earned his bachelors degree in electrical engineering. After college he was hired by Radio Corporation of America or RCA in Camden, New Jersey, as a trainee. While working for RCA, Brown became interested in high power vacuum tubes. Two years later, Brown received a scholarship offer from the Massachusetts Institute of Technology and accepted it. Shortly thereafter, he took a job at Raytheon in 1940. At Raytheon Brown was involved in improving the design of WW II microwave radars. The magnetrons for the old radars were oscillators and not suitable for the next generation radars. Brown came up with a device that he called the Amplitron, the first crossed-field amplifier, which converted the magnetron oscillator into a broadband amplifier. It was patented in June of 1954, #3989994. It was later used in the Navy Aegis radar, the Hawk and Patriot Missile Systems, commercial air route surveillance radar, and the high rate communications systems in the Apollo Lander. Brown later considered that the Amplitron could be developed to a super power amplifier. Next, he proposed to use the microwaves for wireless power transmission. 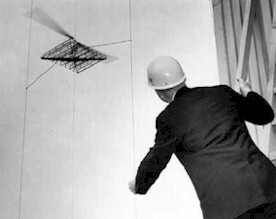 In 1964, with an Air Force contract, he demonstrated on the CBS Walter Cronkite news, a helicopter powered by 2.45 GHz microwaves. As shown below, the helicopter had a propeller connected to a payload of rectenna elements which directly converted the incident microwaves to DC power. Microwaves were beamed into the elements and the helicopter flew for over 10 hours. His microwave to DC converter was patented in March of 1969, #3434678. In 1975, as technical director of a JPL/Raytheon program, Brown beamed power to a rectenna a mile away and converted it to DC power at an efficiency of 54%. William C. Brown was awarded the MTT-S Pioneer Award in 1995. He died in 1999 .